Turkey is your economics professor's evil dream. It's not a Brexit-inspired drop or any kind of external, unavoidable problem. Instead it's the story of an economy that was breaking the rules of economics until it was hit by a great reckoning. The lira is down 40% this year and fell by as much as 16% on Friday before a modest bounce. The linchpin of the disaster was Turkey's current account deficit -- it's need to attract foreign capital in order to pay its debts and keep its economy going. The country has an external financing requirement of about $218 billion. According to the FT, in the next 12 months private non-financial institutions will have to repay or roll over $66bn in foreign currency debt. For Turkey's banks, the figure is $76bn. Much of that was borrowed in foreign currencies and that's going to make it very difficult for those companies to pay the bills when they're due. The problems have been compounded by the currency slide in other ways too. That's sparked inflation and for a time, the central bank governor was a strong technocrat. But recently Erdogan appointed his son-in-law to lead the central bank and the belief is that he will no longer raise rates when necessary. In turn, that's led to more money fleeing the country and more of a need for hikes. Finally, Turkey has been hit with one thing it can't control: High fuel prices. Turkey is a major importer and that's strained its ability accumulate foreign reserves. 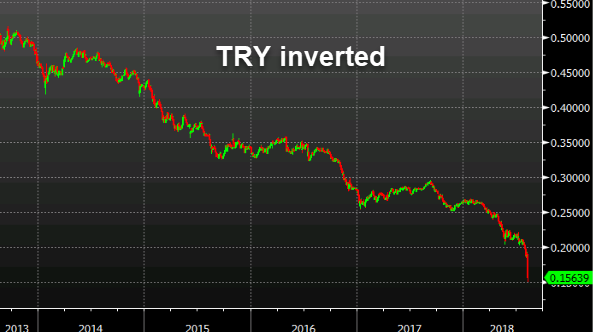 Why is the Turkish lira tumbling?